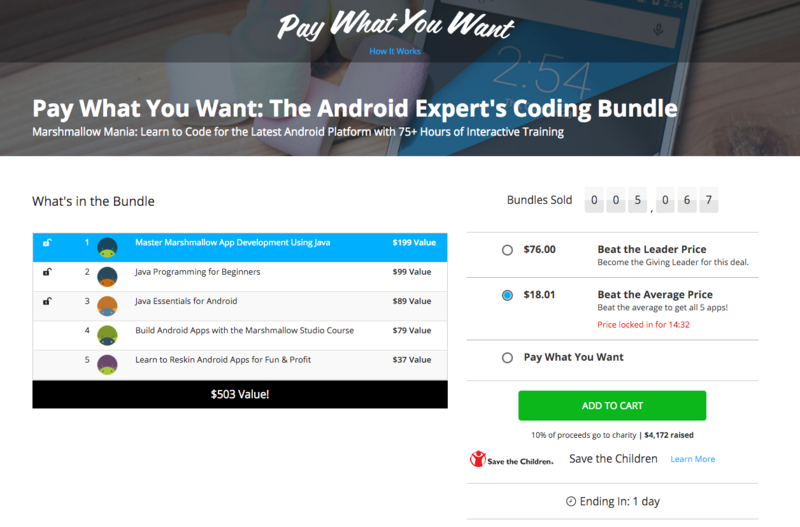 For a few more hours on the DL Deals Store, you can pay what you want for the Android Expert Coding Bundle. Much like what you’d see from services such as Humble Bundle, you can pay whatever price you would like for a portion of the bundle, but if you pay the average or over the average, you gain access to all parts of the bundle. At this time, the average for the entire bundle is $18, with it valued at over $500. Inside this bundle, if you choose to get the whole thing, you will receive access to many courses. These courses include a couple on everything you need to know about Java and how it relates to development on Android, Marshmallow app development, and a course on mastering the Android Studio. In addition to getting these at a highly discounted price, a portion of all proceeds goes directly to a charity. For this bundle, the money goes to Save the Children. For those who pay more than the average, currently set at just $18, you get the following.